Law of Attraction is turning up all over the place it seems (actually that is part of the law!). Perhaps you already know about it … Its got a lot of play in movies like The Secret and What the Bleep Do We Know, etc. My favorite teachers of LOA, Esther and Jerry Hicks (ala The Teachings of Abraham), are topping the charts since Hay House became their publisher a few years ago … with their books Law of Attraction, Ask and It Is Given, and The Amazing Power of Deliberate Intent (to name just a few). 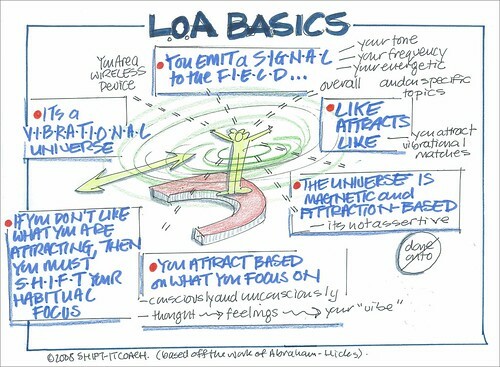 I’ve been studying LOA for many years and it can take a while to really comprehend and apply it. But once it clicks for you, it turns out to be an elegantly simple concept. Law of Attraction is an energy concept … universal like Newton’s Law of Gravity. Advocates of the principle (folks on the cutting edge or the kooky edge … depending on how you look at it) believe that there is an underlying ‘attraction’ law that governs how things work in the world. The basic premise is that everything in the universe is made up of energy. And that energy has a certain vibrational frequency depending on where it resides. Law of Attraction states that similar energy is attracted to similar energy, or more simply: Like Attracts Like. That things that are ‘vibrating’ at a similar frequency, tone or energetic are attracted to one another and cluster together. In this theory, you as an individual person emit an overall signal or vibration to the world and you get back things that match your signal. Not only do you have an overall vibration (a mix of all the different thoughts/feelings that you think and feel) but you also have specific signals on every single topic area that there is in life. Be it m0ney, relationships, work, body, power, health, etc. So you attract to you things that match your particular signal in those areas. This theory contends that the world is magnetic not assertive. Which means, that you ‘attract’ things to you … they don’t assert themselves upon you. We are not ‘done onto’ but instead we are creators of our own reality. This premise is one of the more controversial aspects of the belief system because it really insists on 100% responsibility – which can be a tough pill to swallow when you consider young children, people born into abject environments, etc. Another underlying premise of Law of Attraction is that you get what you habitually focus on. Like a big photocopier or duplicator … your attention and feelings are powerful replication devices (your thoughts/feelings create your particular vibration). That is all well and fine if you happen to be surrounded by things that are beneficial, nice, pleasant, pr0sperous, healthy, etc. That when you look at them you think pleasant thoughts and feel pleasant feelings by what you see (and hence emit a positive vibration). But this becomes problematic if you aren’t in the best of circumstances or are surrounded by people who are negative scanners who teach you to focus and feel in negative ways. Abraham’s teachings guide that most of us are ‘sloppy focusers’. 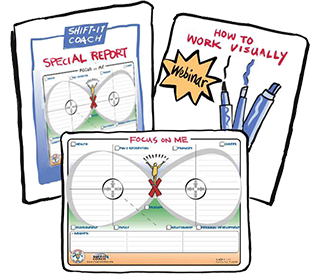 We look at what is around us and focus on that … or take on the focusing habits of the mainstream. If you want to get different results than what surrounds you, you will need to shift your focus from the current reality to what you really do want instead (your desired reality). An example of this is ‘right livelihood’. 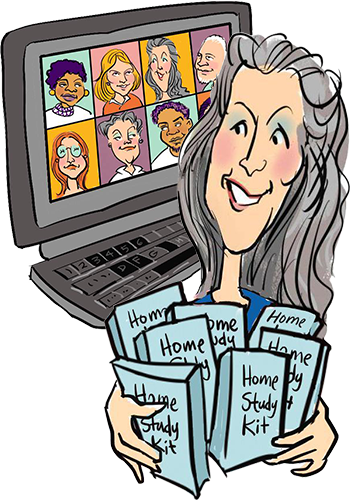 Many of my clients are people who want to improve the state of work or career in their lives. They want more joy, satisfaction, creativity, pr0sperity, etc out of the work that they do. My job as a coach (and a coach who uses LOA principles) is to get them off of what isn’t feeling good in the now and onto what they really do want. We can use the contrast of the now to help launch a ‘rocket of desire’ about their future. And once we have that desired future identified, we give our full attention to it (not to the past or the present). What’s going on in the now with your work that you are dissatisfied about? Take that list of negatives and ‘flip them’ … i.e. figure out what this tells you about what you really do want.i.e. If you don’t want to work in a huge office tower, what do you want? (home office, natural light, nice view). If you don’t want to work with an employer who subtly maligns you, what do you want? (independence, collaborative team work, meeting of equals). If you are tired of doing things the same boring old way, what does this tell you about what you do want? (innovation, creativity, interesting ways of doing things). 3.Speak now about that desired future like you are in it. How does it feel? What are you doing? How are you doing it? Who are you doing it with? What is a typical day like? Where are you geographically? What’s your compensation? A general rule is to go as specific as possible while still feeling good (if in going more specific, your good feelings are interrupted, then back up and be more general). You might like to create some sort of representation of this future, so you can easily remember it and come back to it again and again (as repetition of your desired future is important). This is where things like vision statements, vision boards, etc come in. Anything you can create to help your mind focus on what you do want is very helpful. Click here for previous posts on vision boards, etc. Keeping the energy and attitude from that desired future, what easy next steps can you take to begin to bridge the gap from where you currently are to where you want to be? (being in the energy of your desired future will connect you to new ideas, hunches and inspirations … its important to collect them as aligned action will be a part of your journey of transformation as well). I’ve just touched on the subject of LOA in this article … it’s a big subject. I’ll be writing more about the Law of Attraction and graphic coaching tips in future articles so you can get an even greater handle on this powerful concept. In the meantime, I highly recommend checking out the Abraham-Hicks’ website and YouTube channel. Next issue I’ll be freshly returned from an Abraham – LOA cruise — so I’ll have more to share then.